The Voyage of the "Welcome"
town of Upland, Pennsylvania 19015-1183. The Friends of the Caleb Pusey House, Inc.
​Built in 1683 and occupied by Caleb Pusey, this is the only building still standing which can claim documented association with the proprietor, William Penn, and which he is known to have visited on several occasions. This unique English vernacular house stands beside Race Street, the small road once paralleling the millrace that brought water from Chester Creek to power the mills. "Landingford" was the name Pusey gave to the 100 acre plantation adjoining the mill site deeded to him by Penn which he cultivated to raise food for his large family. Pusey and his family came to Pennsylvania in 1682 along with Penn on the ship "Welcome", to serve as manager and agent for the Chester Mills, the first official proprietary saw and grist mill to be established by Penn in the colony. The Friends of the Caleb Pusey house, Inc. was organized in 1960 to undertake restoration of the house and property which by that time had deteriorated to a point of imminent collapse. The group secured the support of the Pennsylvania Historical and Museum Commission in the project and obtained matching funds from the Commonwealth. Today this organization continues to maintain the house, which is authentically furnished with pieces from the early colonial period and is listed on the national Register of historical Places. The organization also offers frequent programs and activities of historic interest, which are open to the public and operates a museum and gift shop for visitors to the site. You are invited to join The Friends of the Caleb Pusey House, Inc. (FCPH) in helping to preserve and support this important historic place and to participate in its activities. Please explore the "pull-down" menus on our website "calebpuseyhouse.com" ​for more detailed information on all aspects of our fascinating stories. Directions from I-95 North - Use I-95 North exit #5 (Kerlin Street exit), turning left onto Kerlin Street. Continue to the next traffic light (a "T" intersection at Upland Avenue) turn left and follow Upland Avenue to 6th Street. Look for the Pusey Plantation signs. Turn right onto 6th Street to the next traffic light at Main street. Turn left onto Main Street; it will narrow and bend to the right. Follow it to the end and it will lead into Race Street. Watch for the Caleb Pusey Historic Marker at the entrance to the site and continue to the Caleb Pusey House, 1/4 mile on the right side of Race Street. Directions from I-476 or I-95 South - Use I-95 South exit #6 (Widener University exit). 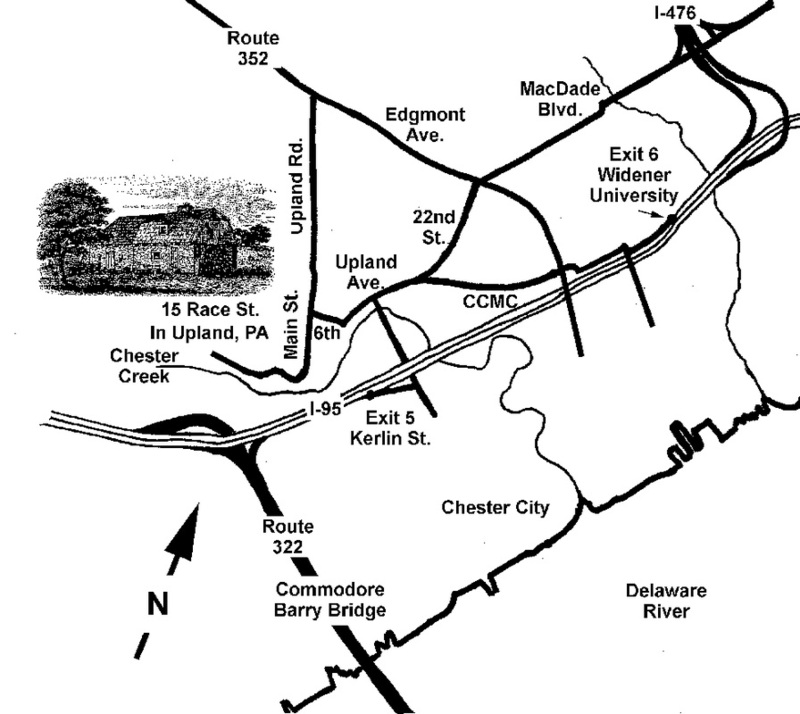 Follow signs to Crozer-Chester Medical Center on Upland Avenue. Follow Upland Avenue to 6th Street. Look for the Pusey Plantation signs, as above. We look forward to your next visit to our site. . This is the one and only official website of the Friends of the Caleb Pusey House, Inc.